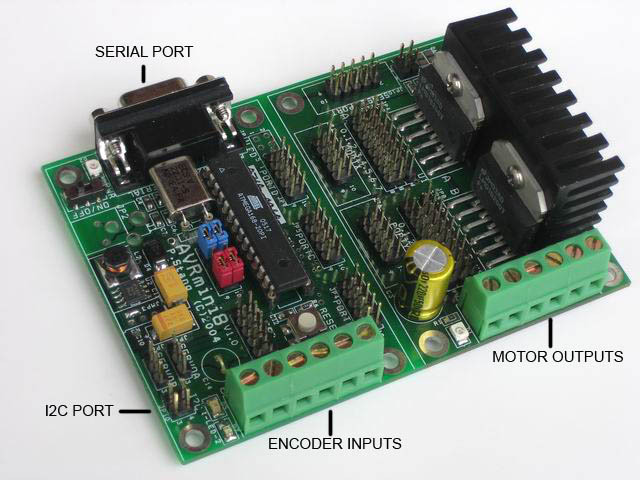 The AVR Motor Controller is a dual-axis motor controller and driver system. The controller uses PID motor control, and can calculate and execute trapezoidal-profile motion control. The controller accepts motor commands and quadrature encoder inputs, runs a PID and motion control algorithms, and drives motors at up to 50V and 3A per motor. The controller can operate two motors simulaneously, with seperate or synchronized trajectories. Power input via DC jack or from motor driver section. 2 Status LEDs and a Power LED. Motor driver supply voltage: 10VDC min to 50VDC max. These commands can be entered interactively or by script via the controller serial port. To communicate interactively with the controller, use a standard serial terminal program such as HyperTerminal or TeraTerm under windows, or minicom under Linux. Drives selected motor to requested position under direct PID control. Drives both motors simulanteously to requested positions under direct PID control (NOTE: pos1 need not equal pos2). Drives selected motor to requested position under PID+PROFILE control. Uses trapezoidal motion profile. Drives both motors simulanteously to requested positions under PID+PROFILE control. Uses trapezoidal motion profile. Resets the encoder counters. Allows reassigning the current physical position to user-selected encoder values. If no arguments are specified then encoders reset to zero. Prints settings and coefficients that are currently active. Stores all current settings and coefficients into EEPROM. The settings are automatically loaded at power-on. Load settings and coefficients from EEPROM. Restores all settings to those last saved with 'w' command. Sets currently selected motor for response recording. Response recording records the actual motor trajectory for the first 200points after the next 'g' command. Returns the recorded motor trajectory data from 'r' command. 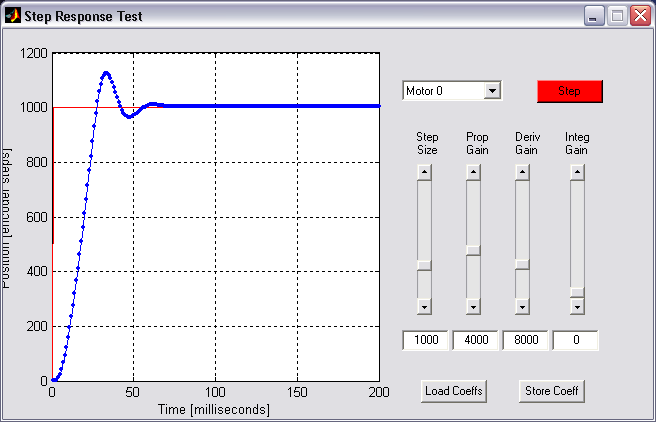 Each data point is the motor position (encoder value) as it approached the target position requested by the 'g' command. Runs automatic motor step-response test. Sets the maximum velocity to be used under trapezoidal profile control. Also used in velocity control mode to set desired velocity. Below this level, the motor power will be clamped to zero. 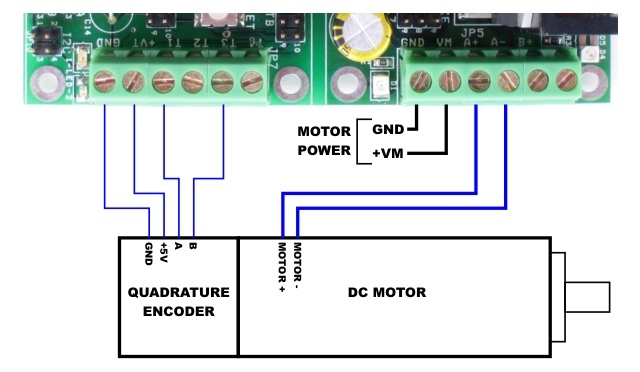 Prints encoder count value for both motors. Press any key to exit. Runs motors in ramp test pattern in both directions. Press RESET to exit. This command list current as of firmware V1.6g, but is subject to change. If the motor moves slugishly, increase Kp and repeat step 3. Now begin increasing Kd until the overshoot is damped and/or the oscillation stops. You now have a basic PID loop tuning. If needed, you can repeat the tuning process but starting with the values you have now. Return to step 3. Finally if you have appreciable steady-state loads on the motor, you may want to set a non-zero Ki. Typical values for Ki are 0,1,2,3, maybe as high as 10 or 20 in special applications. If the motor 'runs away', then the you must use negative coefficients or switch the polarity of the motor leads. Run 'step' in matlab. A GUI window should open. Pick some PID coefficients or use the defaults. Click the 'STEP' button to run a step-response test. The desired and actual response of the motor will be ploted. When satisfied with the tuning, you may save the coefficients you chose to EEPROM by clicking 'Store Coeff'. Most applications in robotics require motors to make smooth movements from point A to point B. A PID control loop uses position feedback from a shaft encoder to drive a DC motor to precise positions. Unfortunately, the PID algorithm does not give us easy control over exactly how the motor moves from point A to point B. Rather, the PID controller is usually tuned for fastest possible motion while avoiding natural oscillations. So while PID is good at getting a motor to a certain position quickly, to get a smooth movement, we need some additional control. 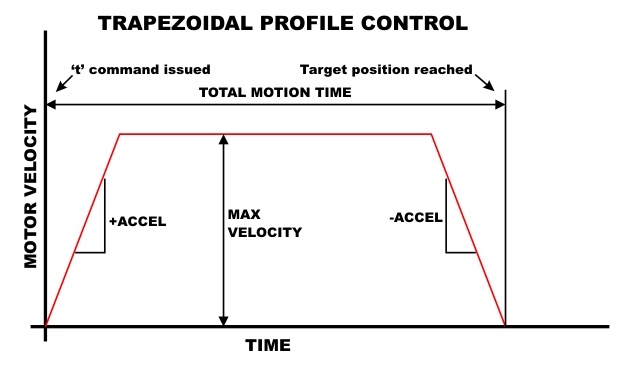 Trapezoidal profiles can be used to command PID to create the smooth movement we want. A trapezoidal profile is a three-step movement process to go from point A to point B. This three-step process is exmplained and shown graphically below. Within each step, the profile controller constantly updates the desired PID position to make the motor follow the profile. PID still handles the lowest level of control. Motor is stopped at point A, but is commanded to go to point B. The profile controller in the AVR Motor Controller allows the user to choose the acceleration and maximum velocity. When a target position is entered, the profile controller automatically calculates the required profile and executes. NOTE: Using the profile controller requires a reasonably tuned PID control loop since the profile controller uses PID control to move the motor precisely.